Corporate Australia delivered earnings growth of 18% in FY17, with the market relying on Resources to do most of the heavy lifting. Disruptive and cyclical challenges remain a defining feature, but a pick-up in capex, a controlled housing slowdown and increased infrastructure spending suggest an improving economic landscape. Australian equities retain support from liquidity and dividend yield, with lucrative opportunities available to the engaged, active and agile investor. With all this in mind, in this update BT Investment Management’s Head of Equity Strategies Crispin Murray provides his views on the outlook for Australia’s economy and equity market. 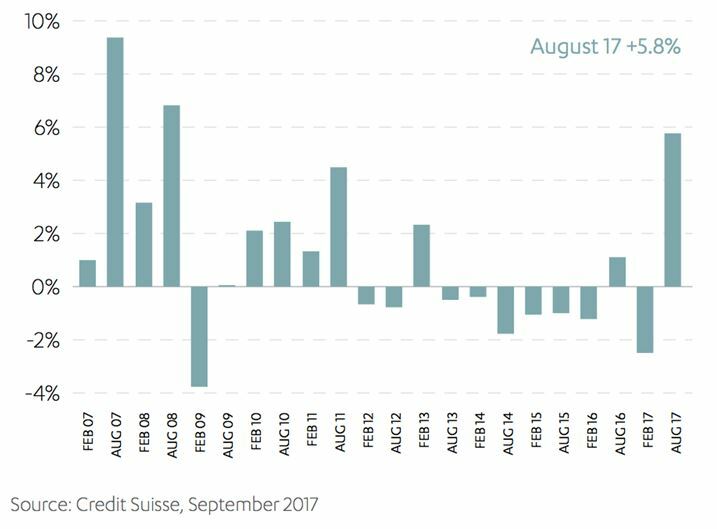 We are more sanguine about the economic backdrop following the August reporting season than was the case six months ago, for three reasons. The first is that, at this point, the slowdown in housing appears to be orderly and is not providing the headwind to economic growth that some feared. This factor demands close observation however, with employment strong and interest rates low, the backdrop is relatively benign. The second factor is that headwinds from declining capital expenditure have abated and capex should begin to be a more positive contributor to growth. There is a balance to be struck here, as it has been capex discipline which has allowed companies to generate cash flow, de-risk balance sheets, and increase payouts in an otherwise sluggish environment. Nevertheless, signs that companies are starting to spend provides a tailwind for the broader economy that we have not seen for some time. The third component is the pipeline of infrastructure as governments roll out a programme of road, rail and metro projects. This has been well telegraphed and has a long lead-in time, but there are now signs that we are moving into a significant uplift in spending. This is coming at a point where mining companies are no longer scaling back on investment, providing a tailwind for employment and activity, which, again, has been missing for some time. As active managers, this is a fertile environment. Uncertainty creates mis-pricing – and mis-pricing creates opportunity. From here, we expect more of the same: a mid-single digit return, driven by earnings. A reasonably cautious unwinding of European QE and only marginal tightening from China means that liquidity is not a headwind. The market is also enjoying support from the significant yield premium it enjoys over bonds. At this point, with little sign of recession and absence of some geopolitical shock, we see the market able to hold its valuation rating. This leaves earnings as the market driver, with consensus expectation of +7% for FY18. Crucially, we believe we are at an inflection point in Australian equities. The dominant trend of recent years – falling bond yields, which fuelled a surge in defensive yield and growth stocks – has waned and bond yields now look range-bound. Chinese policy remains supportive of resource stocks, but is no less opaque than in the past and its future direction rests on the political transition in October. Oil prices likewise look range-bound, with Saudi Arabia’s efforts to cut production and raise prices nullified by production increases from non-OPEC countries. At the same time, we have a market facing unprecedented disruption in the form of new technology, competition, and regulation, which is providing structural challenges to long-standing Australian oligopolies. In short, uncertainty abounds. Themes and trades which have been ‘one-way’ in recent years are no longer. Many companies which have done well are looking challenged. As active managers, this is a fertile environment. Uncertainty creates mis-pricing – and mis-pricing creates opportunity. In this environment there will be divergence between sectors and, crucially, divergence between companies within the same sector. This is where the ability to scour the entire market for opportunities comes to the fore. This is where the opportunity to meet management, gauge their strategy and quality, and to assess their ability to navigate a tricky environment become crucial for an investment outcome. We remain mindful of the challenges and cognisant of the uncertainty, however we believe that our bottom-up, fundamental approach employed by one of the largest teams in the Australian market, is positioned to do well.